My reexamination of Anne Rice’s The Vampire Chronicles has led me to re-read the second book in the series, The Vampire Lestat. I honestly can’t remember reading this book the first time, but I do know that I first read it when I was in 11th grade. It wasn’t my copy, but one I borrowed, and so I must have read it extremely fast. Most of what I remember is most likely based on what I’ve seen since in the movie Queen of the Damned hit theaters in 2002. That film wasn’t very good. It took the pieces of two books, and tried to fit them into a 101 minute film. The other reason my memory may be sketchy is that I had actually read the 3rd book, Queen of the Damned, first. I loved that book, and in fact it’s probably my favorite in the series. To say I was disappointed in the film adaptation is putting it mildly. The Vampire Lestat picks up where Interview with the Vampire left off, but this time told from the point of view of Lestat. In this book he tells his version of what happened during his years with Louis and Claudia, but also reveals to the reader the very things he refused to tell Louis all those years ago. When we last saw Lestat, Louis was visiting him in some run-down house, and discovered his maker in the depths of madness. Lestat reveals how he overcame his malady to rejoin the world, and how he became a rock God. 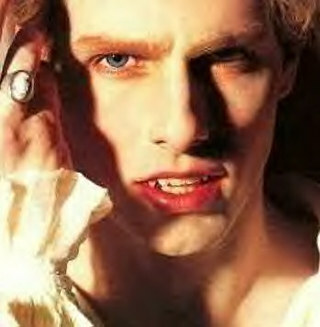 Lestat is a fun character who is unpredictable, self-destructive, intelligent, and lively. We learn how he became the mercurial vampire Louis once lived with, and we get the opportunity to know him as he is now in the present. What is great about this book is how Rice weaves a complicated mythology throughout which foreshadows the books she later comes to write in the series. Not only are we introduced to new characters, but others we are already familiar with return. Though written in 1985, the book is still as fresh today as it was nearly 30 years ago. After reading both books you actually feel as if you have read someone’s memoire, because both are told in a tone reflective of its “author.” While Interview is a maudlin tale of how a young plantation owner received the “Dark Gift,” Lestat is as lively as it’s narrator. Despite that it’s taken me a while to finish the book due to other obligations, The Vampire Lestat was actually pretty difficult to put down. Though I wouldn’t categorize it as a “beach book,” it’s definitely one you should add to your “Must Read” list. Marisa Meyer’s Lunar Chronicles Gets a New Edition This November!